While it was traditional for medieval and early modern pilgrims to acquire pilgrim badges commemorating their journeys — individuals who completed the journey to Santiago de Compostella in Spain, for example, would wear the mark of St. James in the form of a clam shell — travellers to Jerusalem occasionally acquired more permanent mementos of their journey to the Holy Land. 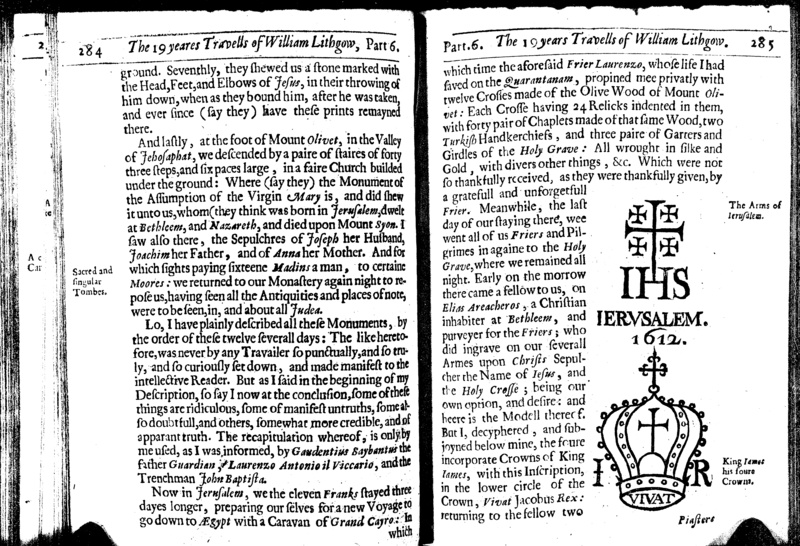 At Jerusalem this our Traveller had made upon the Wrists of his left Arm the Arms of Jerusalem, a Cross Crossed, or Crosslets; and on the Wrist of his right, a single Cross made like that our Blessed Saviour suffered on; and on the sides of the stem or tree of that Cross these words written, Via, Veritas, Vita· some of the letters being put on the one side of that stem or tree, and some of them on the other; and at the foot of that Cross three Nails, to signifie those which fastned our Saviour unto it: All these impressions were made by sharp Needles bound together, that pierced onely the skin, and then a black Powder put into the Places so pierced, which became presently indelible Characters, to continue with him so long as his flesh should be covered with skin: And they were done upon his Arms so artificially, as if they had been drawn by some accurate Pencil upon Parchment. This poor man would pride himself very much in the beholding of those Characters, and seeing them would often speak those words of St. Paul written to the Galatians, Gal. 6. 17. (though far besides the Apostles meaning) I bear in my body the marks of the Lord Jesus.